From the moment you walk into MedQuest College, you see the MedQuest family of values at work. Whether you are looking to start training for Dental or Medical Assisting, MedQuest College makes you feel at home. In the hallways, students discuss their latest projects – sometimes with teachers. In the break room, Billing and Coding students quiz each other over their ICD-10 codes. More than likely, an Admissions adviser is giving a tour. The atmosphere at MedQuest is always inviting and active. MedQuest College wants students to feel comfortable and confident. On a nygiven day, prospective students are touring with their parents as soon-to-be graduates meet with our Career Services Director. There is always something positive happening at MedQuest. Our goal is to provide the fastest path to a career in healthcare with our values as guideposts. MedQuest College is innovating the way students in Kentucky obtain education. Our Dental Assisting and Medical Assisting labs are stocked with the latest technology. Because of our student centered approach, we recognize the need for access to top learning tools. Our students work with modern medical machinery and circuitry in the Biomedical labs. Dental Assisting students in the business classrooms learn the latest coding practices in order to finish reporting for finals. No matter what path you choose at MedQuest College, we make sure you are the center of our attention. Having students feel empowered is important to every aspect of the work done by our Lexington and Louisville campuses. MedQuest College wants our friends to feel empowered when they walk through our door. Teachers are always happy to work one-on-one with students. If you have trouble taking tests, our faculty is ready to work on tips that help you overcome test anxiety. In the classroom, teachers empower students every day. Dental Assisting instructors guide students on how to accomplish their daily assignments. While one Dental Assisting student is working on an x-ray machine, another is studying anatomy for an upcoming quiz. All MedQuest students are empowered through Externship. In Externship, students work with community partners like Mortenson Family Dental and Norton Health to perfect their skills. Externship prepares MedQuest students to take what they learned in the classroom and apply it to their work in the real world. Passion for education drives everything we do at MedQuest College. Our family of educators works every day to communicate their love for allied healthcare in the classroom. Passion is visible during our student celebrations. We believe that hard work needs to be rewarded with a little fun. Our Medical Assistants show off their passion for work during their PPE relay races. This is a great excuse to have fun while practicing skills learned in the classroom. Our Medical Assisting program director recently shred her passion for the field during a visit to Atheron High School in Louisville, Kentucky. We are constantly sharing our goals with community members. MedQuest wants to build strong relationships. MedQuest College is proud to be a member of a family of allied healthcare partners in the state of Kentucky. Community is a large part of what makes MedQuest College such an effective allied healthcare educator. We work with local partners like Norton and Baptist healthcare to strengthen the bonds between leading providers in Louisville and Lexington. MedQuest College is proud to support non-profit organizations like the Catholic Charities of Louisville and Mom’s Closet. In Lexington, MedQuest College regularly partners with organizations like The Nest and God’s Pantry food bank. 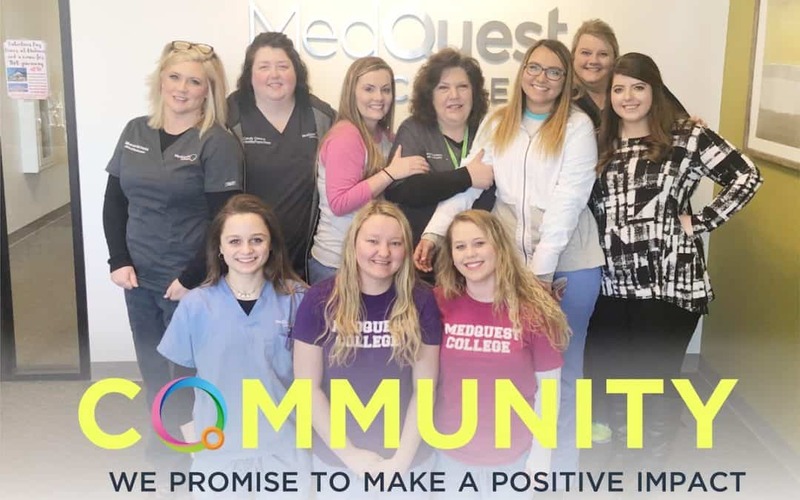 Community at Medquest College means more than just external partners. Community also means building strong networks internally. We encourage students daily to practice together and build each other up to success. Character building is essential at MedQuest College. Students who regularly demonstrate kindness in the classroom are celebrated during the student-of-the-month announcements. Because of our small class sizes, MedQuest College is able to provide one-on-one learning for students in our allied healthcare programs. When we work one-on-one with students, their outcomes are more positive. Every student is unique and building character takes a customized approach. Our faculty are trained to work with traditional and non-traditional students to meet academic goals. Every MedQuest graduate is uniquely qualified to work in healthcare after graduation thanks to our approach. Instructors make it a goal to provide comprehensive exam preparation courses prior to graduation. MedQuest College values character as much as credentials, which is why we take education so seriously. Family can be defined as a group of related things. When you walk into MedQuest College for the first time you become a part of this allied healthcare family. Every program, faculty member and student make up our family group. Between the Lexington and Louisville campuses, MedQuest College is home to the most dedicated people working in allied healthcare. The administrative staff is always around when students need it most. MedQuest College instructors are more than just support – they build healthcare professionals with precision. If you want to be successful in allied healthcare, visit www.medquestcollege.edu and request more information. Join a family of professionals that know how to succeed this year at MedQuest College.